“East” takes us on a journey through the fields and woods outside of Alexandria as The Walking Dead provides continued conflict with the Saviors. As Morgan tells Rick, “You started something.” The Saviors aren’t going to take the attack on their compound lying down, and they’re closing in on Alexandria. The Walking Dead shows us that while inside Alexandria residents may find moments of safety and joy within the relationships they’ve built, life outside the walled community is still the Wild West, putting everything they have created in danger. “East” opens with a blood-filled scene as we hear Carol telling someone to come out slowly and see her cross on the ground. Lest we forget, The Walking Dead wants to remind us that the world is bloody and that Carol is nobody’s victim. After the chaotic scene of the open, we flash back to the time when Carol was preparing to leave Alexandria. She sews her jacket, either repairing it or hiding something inside in case of confrontation or capture. She’s prepared with weapons and rations. When Tobin comes in the room she hides her pack under the bed. Tobin wants to talk about Denise. He knew her since the beginning. Carol puts on her nurturing face, though her mind races with preparation for her departure. Carol mentally returns to the moment with Tobin, telling him that she feels for Tara, who will return to find her girlfriend is dead. Carol has already decided she can no longer have these kinds of connections. They are too much for her to bear because she knows she’ll do anything, become anything, to protect those she loves. After Tobin is asleep, Carol makes her way out of Alexandria. Life inside Alexandria continues despite the growing threat outside. Though they’re preparing for attack, they’re also building a community based on human connection and caring. In the weapons locker, Carl finds a gun with what looks like a barbed wire bat carved on the handle. Looks like part of the haul from the Saviors. Carl takes the gun for himself. In the shower, Glenn and Maggie find a moment to escape the threats of the outside world and focus on each other. Glenn comforts Maggie when he sees the bruises from her capture in “The Same Boat.” Daryl sits on his motorcycle, dealing with his guilt and anger about Denise’s death. He’s using the “Dennis” keychain that Denise took from the apothecary in “Twice as Far.” Sasha and Rosita are on guard duty. Abraham arrives and Sasha gives him a cigar when he relieves her on guard duty. Rosita watches from afar. Daryl takes off on his motorcycle, refusing to tell anyone where he’s going. Glenn, Michonne, and Rosita go after him. Rosita seems to know where Daryl is heading. Daryl wants vengeance on the Saviors who killed Denise. Tobin finds the note from Carol, telling him that she’s leaving and not to come after her. Despite Carol’s request to be left alone, Carol’s frenemy Morgan immediately prepares to go after her, along with Rick. Tobin seems to know he would only be a liability on the road, or at least that’s what we assume when he doesn’t offer to join in the search. Outside of Alexandria, Carol comes upon a pickup truck full of men. They blow out her car tire when she gets close. She gets out of the car, holding up the rosary, calling out, “Please don’t hurt me.” She tells them that she’s Nancy from Montclair. She might’ve been Nancy from Montclair in the past, but that’s not who Carol is today, and these men have no idea. She’s questioned by a man named Jiro, who wants information about Alexandria. Carol begins to cry and shake. She tells them, “It doesn’t have to be this way. You could turn back and you could go home. No one has to get hurt.” The men interpret her response as one of fear that they’ll hurt her, but the truth is that Carol knows she can take these men but doesn’t want to continue adding to her death list. While still holding the rosary in her other hand, Carol begins to shoot with the gun hidden inside her coat sleeve. Rick and Morgan drive along, looking for Carol. Morgan points out that Carol’s tracks indicate she went east, the opposite direction of the Saviors’ compound they previously attacked. Morgan is trying to tell Rick that Carol wants to get away from the killing, but Rick responds, “You don’t even know Carol.” Morgan takes this opportunity to proselytize about his philosophy of peace. They follow a trail of blood into a field in hopes of finding Carol. Rick realizes that there are more Saviors and that they didn’t end things with their attack on the compound. Morgan tells him, “No. You started something.” The driver of the pickup truck has been hiding in the woods and comes out once Morgan and Rick are out of sight. He picks up Carol’s cross and follows them into the field. Rosita, Glenn, and Michonne are at the tracks where Denise was killed. Michonne finds Daryl’s motorcycle hidden in the bushes. Glenn wants to know which way Dwight went, but Rosita thinks they should let him go after Dwight. Glenn tells Rosita, “But he doesn’t know what he’s doing. We don’t. Maybe him trying this makes you feel better about it right now. Maybe they keep knowing more about us than we know about them. Or maybe Daryl’s going to get himself killed.” We’re not sure if he’s just tired, but Glenn’s had better speeches. Rosita indicates where Dwight went and they begin to follow the trail. We see Daryl in a clearing. He hears a noise and shoots an arrow, nearly hitting Rosita. Daryl feels like Denise’s death is his fault because he let Dwight live after their confrontation in the burned forest. He wants to go after Dwight to do what he should have done in the first place. Glenn astutely points out, “She’s gone, man. You’re doing this for you.” Glenn tells Daryl, “We need to go back there and figure this out from home. It’s going to go wrong out here.” Though Glenn’s speech is much better, and so true, it doesn’t have the intended effect. Daryl can’t let go of his anger and guilt, and it turns out that Rosita can’t either. As Rosita and Daryl continue to follow Dwight’s trail, Glenn and Michonne head back, knowing that the Saviors could be attacking Alexandria at any time. As they walk back, Glenn tells Michonne that even though they worked together to come up with a plan, everything with the Hilltop and the Saviors was much bigger than they realized. Just then, Dwight and his men come out of hiding, guns on Glenn and Michonne. It seems that Daryl isn’t the only one out for vengeance today. As Rick and Morgan continue to track Carol through the grassy fields, Morgan pushes Rick to look at how he has changed. Morgan knows that Rick banished Carol from the prison for killing Karen and David. He asks what Rick would do if that happened now. They come upon a farm where they hear a noise and find a man at a farm killing walkers. From hiding, the man says he’s looking for his horse and Rick says they’re looking for a friend. As walkers encroach, the man runs. When Rick tries to shoot the man Morgan stops him. After they take care of the walkers, Rick finds that the man had a spear made at Hilltop. He notes that the man could be a Savior looking for Carol. In turn, Morgan points out that he could actually be a man looking for his horse. Rick tells Morgan that he doesn’t take chances anymore. Morgan tells Rick about the Wolf whom he captured and kept in the cell. Rick is pretty upset that Morgan kept this dangerous man in the community. He tells Rick that the Wolf saved Denise’s life when swarmed by walkers, and then Denise was there to save Carl. “It’s all a circle. Everything gets a return.” Rick seems stunned. Morgan tells Rick to go back to Alexandria and that he will continue looking for Carol. Morgan adds that if he doesn’t come back that Rick shouldn’t look for him. Rick insists Morgan take a gun. Just before he leaves, Rick tells him, “Morgan, Michonne did steal that protein bar.” They smile at this funny moment, and it hearkens back to the times that these two men have helped each other survive over the course of the series. Rick returns to Alexandria, where he and Abraham stare outside the gate, wondering when the Saviors will attack. They don’t know that an attack has already begun, well outside of the gates. Abraham asks Rick if he’s afraid to get close to someone again. Rick acknowledges his fear, as does Abraham. Yet Abraham admits that it drives him as well. Both men want to protect what they’ve created inside these walls. After Enid earlier helped Maggie by taking her watch shift so the pregnant woman could rest, Maggie asks Enid to cut her hair. When Enid asks why cut her hair now, Maggie tells her, “I have to keep going and I don’t want anything getting in my way.” Maggie suddenly doubles over in pain and begins to scream. Times like this you really miss having a doctor in Alexandria. In the woods, Rosita and Daryl have spotted the captured Glenn and Michonne, who are bound and gagged. As Daryl signals to Glenn to keep quiet, Glenn begins grunting to warn him. But it’s too late. Dwight and another man come up behind Rosita and Daryl, holding guns on them. As Daryl begins to turn to attack, Dwight shoots, and blood spatters on the camera. As we hear a thump of someone falling to the ground, Dwight says, “You’ll be all right.” Dwight’s words seem meant to assure the audience that Daryl still lives, but you can’t trust anything in The Walking Dead. 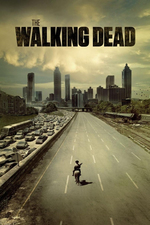 “East” provides both moments of intimacy and action as Season 6 of The Walking Dead heads towards the final episode. Despite the challenges in “East” with dialogue and inconsistent character choices, the episode was engaging and the cinematography was beautiful. “East” leaves us in suspense as to what happened with Daryl, Maggie, and Carol, building our anticipation for the Season Finale. Read our full review of “East” here.